The 1,800-foot-wide asteroid 2004 BL86 will make its closest approach to Earth for the next 200 years on Jan. 26, 2015. This NASA graphic shows the position of the asteroid in relation to Earth as they will appear on Jan. 19. A large asteroid about a third of a mile wide will zoom safely by Earth this month, and mark the planet's closest encounter with a space rock of its size until 2027. The asteroid 2004 BL86 will fly by Earth on Jan. 26, passing at a range of about 745,000 miles (1.2 million kilometers), about three times the distance between the Earth and the moon. It will be the asteroid's closest approach to Earth for the next 200 years, according to NASA scientists. 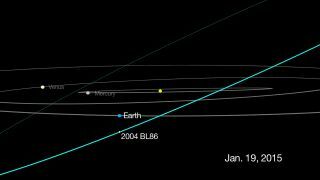 "While 2004 BL86 poses no threat to Earth for the foreseeable future, it's a relatively close approach by a relatively large asteroid, so it provides us a unique opportunity to observe and learn more," Don Yeomans, of NASA's Near Earth Object Program Office at the Jet Propulsion Laboratory in Pasadena, California, said in a statement. Astronomers will track asteroid 2004 BL86 with radar during its flyby by using the massive dish-shaped antennas at NASA's Deep Space Network in Goldstone, California, and the Arecibo Observatory in Puerto Rico. These radio dishes will beam microwave signals at the asteroid, which will then bounce off the target, and return to Earth. The resulting radar "echo" looks like a sonogram and can reveal details about the asteroid's three-dimensional shape, its rotation and even its internal density. Although this method has detected echoes from about 200 near-Earth asteroids before, no two are the same. "At present, we know almost nothing about the asteroid, so there are bound to be surprises," said JPL astronomer Lance Benner, who is the principal investigator for the Goldstone observations of the asteroid. Astronomers first detected the asteroid on Jan. 30, 2004, with the 1-meter LINEAR telescope in New Mexico. At its closest approach, it’s expected to be observable from the Northern Hemisphere with small telescopes and strong binoculars. "I may grab my favorite binoculars and give it a shot myself," Yeomans said. "Asteroids are something special. Not only did asteroids provide Earth with the building blocks of life and much of its water, but in the future, they will become valuable resources for mineral ores and other vital natural resources. They will also become the fueling stops for humanity as we continue to explore our solar system. There is something about asteroids that makes me want to look up." But if you prefer to not brave the cold weather, you can always watch it online via the Virtual Telescope Project in Italy.